First: that perceived control can moderate stress reactions (Glass & Singer, 1972). This means that even if every employee in that office space is under pressure and inundated with work, these panel extenders give them control over their own cubicle, that one space they feel is their personal zone. This provides more focus on what they need to do in order to get the work done. Sure, they may look across and see how their co-workers are faring and can communicate when needed but, researchers find that the ability to control one’s own environment has a significant impact on personal satisfaction. And, a more satisfied employee can block out the stresses of others and focus on their own creativity. Second: these panels can even help during cold and flu season! As most employers know, this is the time of year when offices are half empty or full of people who are ill. 1-in-4 U.S. employees go to work sick and with this open-work space, colds can get passed around quickly. How can someone possibly be at their creative best when they feel bad or are so sick they have to miss several days of work? Cubicles do provide some protection because employees can isolate themselves better but, these panel extenders offer an added barrier that helps to safeguard them and keep the germs out. Third: creativity can be blocked because of one simple thing: noise. The psychologist Nick Perham, published a study on Applied Cognitive Psychology, and found that office noise and confusion impairs workers’ ability to recall information and, can even have an effect on doing basic math. This is why libraries are so quiet; so people can think. In cubicles there is a measure of privacy but, continuous ringing of phones, loud conversations and other distractions can actually undermine employee motivation. It all comes back to control. Part of the reason office noise reduces motivation is because workers know the noise is going to be there but, feel as if there is just nothing they can do about it. This can be frustrating and unproductive if that’s all they’re really focused on. By providing office panel extenders for their cubicles, this gives them back part of that control because some of those distracting nois es will be muted. A study published in the Journal of Applied Psychology says that office distractions will make employees stressed and feel as if they are not working at their best. Add to this, a feeling of powerlessness in not having any personal space and, the fear of catching a cold or getting the flu; this can prevent them from being creative and is not a good way in bringing out their best. 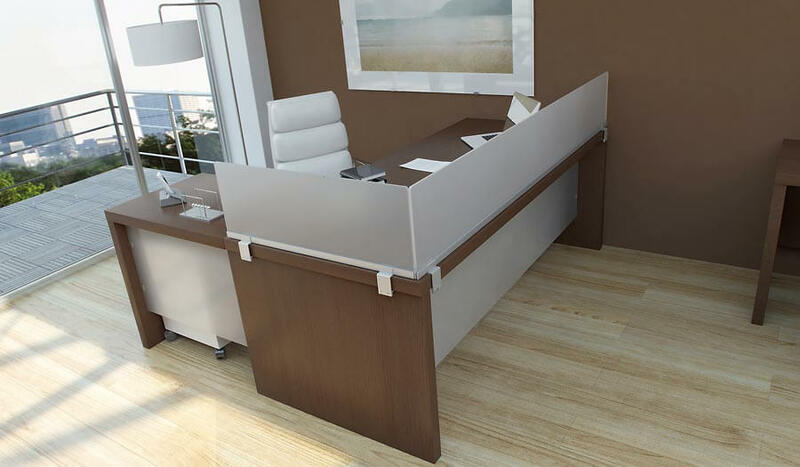 Providing your workers with office panel extenders for their cubicles is the best solution in giving them a sense of privacy and, help them stay productive and imaginative. To talk about this, please contact us today for more information. The original plan for the cubicle was much different than how it is often implemented today. Robert Propst, the man credited with creating the cubicle, developed his unique Action Office concept in the 1960s. It was a much different model than the modern cubicle floor, with varying cubicle height, extenders if needed, and a departure from the 90 degree grid. Propsts’ original vision was that cubicles would themselves be fluid, and only part of an office layout plan. Instead, many companies crammed as many identical cubicles as possible into their square footage, and the era of the cube rat began. Where in the past, 80 to 90 percent of an organization’s budget was spent on individual workspaces, the numbers fell abruptly to 65 to 70 percent and today are in the process of scaling down to 50 percent. The need for exclusive workspace is a given, but an even greater need is a space where workers feel at ease – the design should be good enough that the “anywhere but here” attitude fades away and the office seems just as good a solution as telecommuting from home or a coffee shop. There’s no one size fits all in any other facet of life, why should a workspace be so different? Thankfully, things like cubicle height extenders, privacy panels, and a designer with a sense of flowable space can help create an office where everyone has as much space as they need, acoustics are dampened enough to allow distraction free working, and each person feels like they have a modicum of privacy without being boxed in. Using a free flowing mindset and taking into account not only the personalities of every type of worker but also the type of work they do and whether or not they will be expected to collaborate or work alone can help create a cubicle setting that is friendly and comfortable. 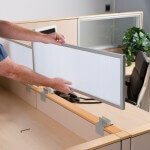 Cubicle height extenders are a good starting point, but that’s only the beginning! 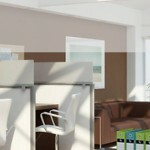 Why should your office depend on a cubicle layout rather then the trendier “open office design”? Two words – workplace distractions. Although open office layouts have dominated office design style for several years, studies reinforce the fact that having a private space to work in increases employee productivity and satisfaction! The most common source of distraction in open office designs is background noise. Even an overall noise level of just 55-60 dBA can cause major deterioration in employees’ ability to concentrate.” The four culprits most likely to cause strife are ringing telephones, conversations between co-workers or between a coworker and a party on the other end of a phone, keyboard clacking, printer or computer noise, and sounds from outside. Many office managers are prompted to tell new employees “You’ll get used to it”, but the opposite is actually true – many employees become more annoyed and distracted by excessive background noise the longer it goes on. Converting from an open office design to a cubicle layout by using panel extenders and cubicle height extensions can greatly increase employee’s sense of privacy and reduce the amount of noise from adjoining co-workers and common spaces. In addition to using panel extenders and privacy panels to give each employee their own sound baffled workspace, creating quiet areas away from noisy equipment and other people allows for serious phone calls, focused programming tasks or writing work. Printers and copiers can be relegated to a separate area so the noise they make is less distracting, noise cancelling headphones can be provided to employees on request, and phones chosen that have adjustable ringtones that are less obnoxious than standard default. The conversion from open office to cubicle format may not be instantly accepted by employees, but as long as open common areas and comfortable break rooms are maintained to get employees “out of the box” during breaks and lunchtimes there should be a short adjustment period followed by acceptance and embracing of the new layout. 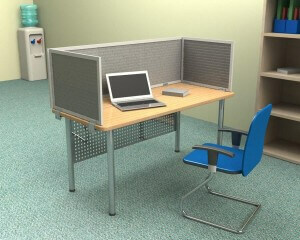 Overall, cubicles cut down on distraction in the workplace and will improve overall efficiency and employee morale. Consider trading in your open office design for a more practical layout, and cut down on constant distractions throughout the day without making workers feel overly boxed in. It’s Friday, which means we are open for discussion once again on the topic of workstation privacy. Today, let’s talk about the infamous at work personal phone call. Short of banning personal phones from the workplace (difficult when so many employees use their phones for work AND play), keeping a lid on the abuse of workplace phone privileges can be tough. In the cubicle environment, it can be even harder to maintain professionalism and privacy, even with cubicle wall extenders and privacy screens. Allowing a quiet space for workers to make personal calls (a cubicle with extra privacy panels set up in the corner away from the main grouping) can help. It makes it fairly obvious to the manager who is spending too much time on non-work-related phone calls, but gives workers better privacy when they do have to deal with sensitive situations while at work. Have you ever had an issue with a co-worker intruding into your life as the result of an overheard phone call? Tell us about it! It’s time to look at another entry in the Best of NeoCon 2013 competition hosted by Contract Magazine. This entry is from Peter Pepper Products, a company that’s well known for its trendy and eye-catching office furniture accessories. For this year’s NeoCon, the firm is entering the Slalom EcoFlex Partition System into the competition. It appears that PPP is the US distributor for the product. This particular piece is by designer Elettra de Pellegrin from Italy. The Slalom is named after the type of ski trail with poles placed close together for skiers to navigate between. In the same way, this flexible panel can weave its way between workplace obstacles to divide spaces in many different ways. Dividers can be connected in an intersecting fashion, in curves, or at right angles. The panels are modular (you can connect up to four in a row). We see this product being useful as a temporary way to create collaborative environments in the open office or to make touch-down areas for mobile workers. They could also be used to manage the flow of traffic or keep noise levels under control in busy areas. You could even construct a maze! Come to think of it, the things we like about these full-height freestanding panels are the same things we like about our OBEX panel extenders and desktop dividers. Maybe we should make a curvy desk divider next. What do you think? Share your thoughts in the comments. There’s a compelling infographic over at MyTurnstone.com that compares and contrasts two very different personality types and how they like to work. It’s not surprising to find that extroverts prefer an office environment that’s bustling and active. Introverts, on the other hand, tend to do their best work when they have more solitude. It’s not that they don’t like to collaborate or don’t know how to be a part of a team. They just don’t cope as well when they are forced to process a great deal of outward stimuli (especially social interaction) when they are trying to work. In a 2012 article posted over at atlanticcities.com, Allison Arieff points out that 1 out of 4 people may be introverts. That’s a pretty hefty chunk of your workforce. But it’s not just these less social types who desire a little more personal space. She also points out that most employees of all personality types seem to prefer some form of separation from their colleagues. All but the most gregarious are daunted at the prospect of a completely open office with no dividers. In general, people want to socialize by choice, not because they have zero privacy. So, by being kind to your office introverts and offering the option of privacy panels, you’ll actually be making all your workers happier. Here we are at the end of our series on Steelcase’s “Defining the Code” report. It’s been quite an interesting meander through all the ways groups and individuals perform within a given work environment and a given culture. It’s certainly lifted the curtain away from the hidden assumptions and unspoken rules that drive much of the day to day operations in a business. You can probably guess where most Americans and US organizations fall on this spectrum. We want what we want when we want it (and that would be RIGHT NOW). From the perspective of a company that’s gone public with its stock, it can actually be considered irresponsible to take a course of action other than the one that maximizes short term profits. Our society as a whole has both a short attention span and a hunger for immediate results. We don’t tend to give a lot of thought to the future – especially if we think the problems it brings will be shouldered by someone else. Of course, the opposite attitude can be just as problematic. Those who have only a long term perspective may be too mired in tradition to evolve with the times. They may tend to stifle innovation and discourage bold action out of a surfeit of caution. Penny pinching can sometimes be the road to poverty in business while perseverance taken too far may mean breaking instead of bending when things change around you. The key is to have a balance between short and long term thinking so you don’t forego current opportunities or disregard the consequence of today’s actions.